Today I’d like to introduce you to my new favourite midweek meal. 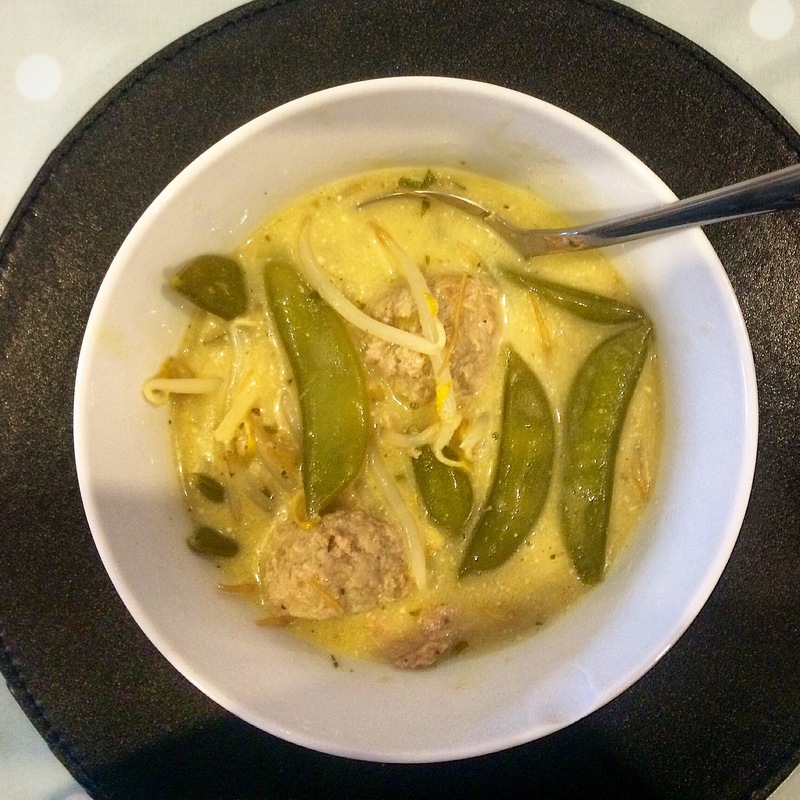 We all love a curry, but I have to confess Thai green curry is my absolute favourite. The combination of those classic flavours of lemon grass and ginger is just so uplifting and refreshing, I feel like I’m eating a bowl full of health! I’ve adapted my favourite curry into a soup, foregoing the heavy rice and making it a quicker and lighter midweek meal. However if you like a little something extra, a handful of rice noodles at the bottom of the bowl would give you your carb fix without making the dish too heavy. I’ve chosen turkey as a nice light lean meat, however pieces of chicken would also work. Seafood would also really take this dish to the next level, I’d personally like to try this with prawns. I also love plenty of chilli in mine, however I’ve left it out of the recipe this time as the rest of the family aren’t too keen on too much heat. If you’re a lover of the spice, throw a finely diced red chilli in alongside the garlic, it’ll made it just that bit more colourful too! This whole dish is ready in less than 20 minutes making it absolutely perfect for busy weeknights. It’s also a great one for if you’re feeling a little under the weather as the garlic, ginger and lemongrass do wonders for clearing up those sinuses! 1. In a wok heat a little sunflower oil on a medium to high heat. 2. Add the meatballs and fry until they no longer look pink. 3. Add the Spring onions and garlic and fry until softened, throw in the sweet peas, lemon grass and ginger and cook for a further minute. 4. Stir through the curry paste, ensuring everything is coated and cook for a couple of minutes. 5. Add the stock pot and hot water and bring to the boil. 6. Add the coconut milk and add the splash of fish sauce. Bring to the boil and then cover and simmer for 10 minutes. 7. Add the lime juice and stir through the fresh herbs before serving.